Los Angeles Motorcycle Accidents Law Firm | The Goel Firm, P.C. According to state records of motorcycle registration, there are currently approximately 6,000,000 motorcycles registered in the United States. Americans use motorcycles for various purposes such as personal transportation, pleasure riding, sports competition, and commercial activities. An inevitable consequence of the increased popularity and use of motorcycles in recent years has been a drastic increase in the number of accidents involving them. ● There are many motorcycle fatalities, and motorcycle accidents lead to very serious injuries including catastrophic trauma including brain injuries and spinal cord injuries. (hyperlink to this page of content). Litigation involving motorcycle accidents presents unique issues for plaintiffs. Challenges with cases involving motorcycle accidents, be it a drunk driving accident, a faulty products case, or even medical malpractice, is that people and hence jurors believe motorcycles are not safe —period. Regardless of facts, even those in favor of the plaintiff, some jurors will point the finger at the motorcycle rider and say, “If s/he wasn’t driving that dangerous vehicle, none of this would have happened.” This challenge, of course, spills over into damages phase of such a case. Some jurors may be unwilling to award substantial compensation. This is due to an attitude of almost, “S/he asked for trouble by riding the motorcycle.” As a result of this unique set of challenges for motorcycle accidents, it is imperative to consult and hire a capable personal injury attorney who can overcome these issues. Contact us for a Free Case Evaluation. Motorcycle manufacturers have a duty to design motorcycles that do not expose riders to an unreasonable risk of harm in the event of a collision. This is known as the “crashworthiness” doctrine, also commonly referred to as the “enhanced injuries” or “second collision” doctrine. This enhanced duty has sometimes been used by courts against motorcycle manufacturers in products liability cases involving accidents. One of the most cited examples of a successful application of this doctrine are for leg guards of a motorcycle. It has been held that the dangers associated with motorcycles that are not equipped with leg guards are open and obvious, and a manufacturer should be held liable for injuries aggravated by the absence of such a safety feature. Other examples for the application of this doctrine include injuries from an explosion of a motorcycle gas tank in a collision, injuries from a rider coming into contact with the metal luggage rack on a motorcycle’s gas tank, and injuries from the moving gears of a motorcycle’s clutch housing which can break during an accident. Serious injuries sustained in a motorcycle crash can trigger astronomical bills. For example, hospitalization at a trauma center for a head injury can cost as much $100,000. An attorney dedicated to personal injury claims will help you to recover the costs for any hospital stay, surgery, doctors’ visits, diagnostic tests, physical and rehabilitative therapy, and chiropractic care. You may further be entitled to the costs of future medical care, if your conditions will require ongoing treatment. Motorcycle accidents inflict a wide range of injuries, whether they are temporary, longer-term, or disabling. The law allows for compensation for the pain and suffering associated with these injuries, yet it does not provide a fixed formula to calculate that compensation. To recover the maximum amount that your injuries warrant, one will need the help of a dedicated personal injury attorney who is equipped with the knowledge and experience to best evaluate your claim. Time lost at work due to injuries inflicted by a motorcycle accident can be significant and have serious ramifications on your finances and family responsibilities. If your motorcycle accident injuries prevent you from working, then all your lost wages may be included in any claim for recovery against the negligent party. Even if you used sick leave or vacation time during the recovery period, reimbursement may be available in your recovery. What if your injuries leave you permanently disabled and unable to work ever again? In conjunction with this firm’s experts, a personal injury lawyer can calculate your future losses and recover for your diminution in lifetime earning capacity. Loss of consortium is cause of action that may be brought by a spouse of the injured party for loss or harm he or she suffered as a result of bodily injury caused to the injured spouse by a negligent party. 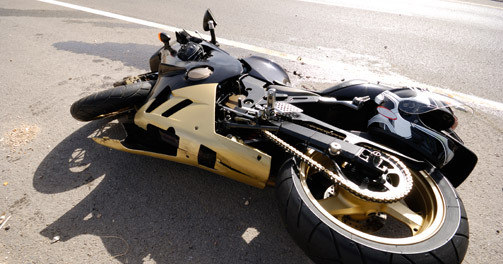 If a motorcycle accident resulted in the death of a party, then there may be a cause of action for wrongful death. A wrongful death action arises in favor of certain statutory outlined survivors of a decedent of an accident. The survivors who are entitled to bring a wrongful death claim include but are not limited to the decedent’s surviving spouse, domestic partner, children, or issue of deceased children. (1) Call the police and file an accident report. Filing such a report will help document the event and shed light on who was at fault in the accident. (2) Receive prompt medical attention for yourself or anyone involved in the accident. If the injuries require emergency care, call an ambulance for transport to a hospital. If the injuries do not require emergency care, visit a medical care center or arrange to be seen by your regular physician. Some motorcycle injuries, including serious ones, may be latent and hence it is essential to be examined by a medical care provider as soon as possible. (3) Attempt to gather information at the scene of the accident. Anyone involved in a motorcycle accident is required by California law to exchange contact and insurance information. Try to take photos of the damage and if there are witnesses to the accident, obtain their names and contact information. Witnesses to such accidents can be crucial in determining who was at fault. (4) Do not give statements to the insurance companies’ representatives about the motorcycle accident, without first contacting a personal injury attorney. (5) Immediately contact a Motorcycle Accident Attorney. It is crucial to immediately seek counsel so that any evidence available is immediately and appropriately gathered before it is lost or destroyed, and that any possible witnesses are found and interviewed while their recollections are still fresh and useful.